Joanne Chang—owner of Flour Bakery, author of Baking with Less Sugar, and all-around dessert wizard—has discovered that less sugar can often mean more flavor. Today, a classic French dessert gets turned on its head when maple syrup replaces white sugar. I first learned about the classic French pastry tarte Tatin when I was a budding amateur baker fresh out of college. I worked as a management consultant as my day job, but in the evenings and on weekends, all I did was bake and dream about someday becoming a pastry chef. Pastry is all about precision, measurements, timing, techniques. I poured over every baking book I could find. Everything was so French, so perfect, so unattainable for a novice like me! Tartes Tatin combined two techniques that I was determined to master: flaky pie crust and proper caramel. I fell in love with tarte Tatin partly because of the fantastic story of how it came to be. According to pastry lore, the Tatin sisters ran a hotel near Paris and one of the sisters made the desserts for the restaurant. One evening, she was overwhelmed with too much to do and as she was making apple pie she realized she overcooked the filling and it was starting to burn (others say she forgot to line the pie tin with pastry). In an effort to save the dessert, she quickly rolled out a pie dough circle to place on top of the cooked apples and put the whole thing in the oven. She inverted it onto a serving plate when it was baked through and the accidental upside-down pie was an instant success. A hasty mistake on a busy night that ends up becoming an iconic dessert...there was hope for the mishaps that I was experiencing as I made my way through my pastry textbooks after all! Apple is the classic fruit for tarte Tatin but you can use pears, quince, or really any fruit that isn't too juicy or soft. A firmer fruit will absorb the butter and sugar as it bakes and become infused with the rich caramel without falling apart. It's important to pack, pack, pack in the fruit because it will release some liquid and shrink a bit in size as it bakes in the oven. When you think you've put in enough fruit, cram in a little more—you don't want gaping holes in your tart. What makes a great tarte Tatin is a deep dark almost-burnt caramel—if it's too light it can taste insipidly sweet and uninteresting. So don't be afraid to take that sugar to almost smoking! Learn how to make tarte Tatin without a recipe. I'd been playing around with maple syrup for my book Baking with Less Sugar and wondered if it was possible to make this traditional dessert with maple instead of sugar. Maple has a buttery, mellow sweetness that offers wonderful flavor to any dessert it is used in. Could I caramelize maple instead of sugar and still imbue the fruit with the same buttery richness? I had successfully caramelized maple for a maple crème caramel for the book, so I didn't see why not. When you bring maple syrup to a boil, it has a tendency to foam up and take over the pot—make sure you use a nice big roomy pot. Once it foams, turn the heat down to a steady low simmer. At this point it can be deceptive: You'll think it's just simmering and reducing there nice and calmly, but it can foam up again, so watch it and monitor the heat. For this tarte Tatin, as soon as the maple is reduced and caramelized, you whisk in some butter and then pour it into a metal cake pan. The maple will harden upon contact with the baking vessel but don't worry about it—just spread it out as much as you can. 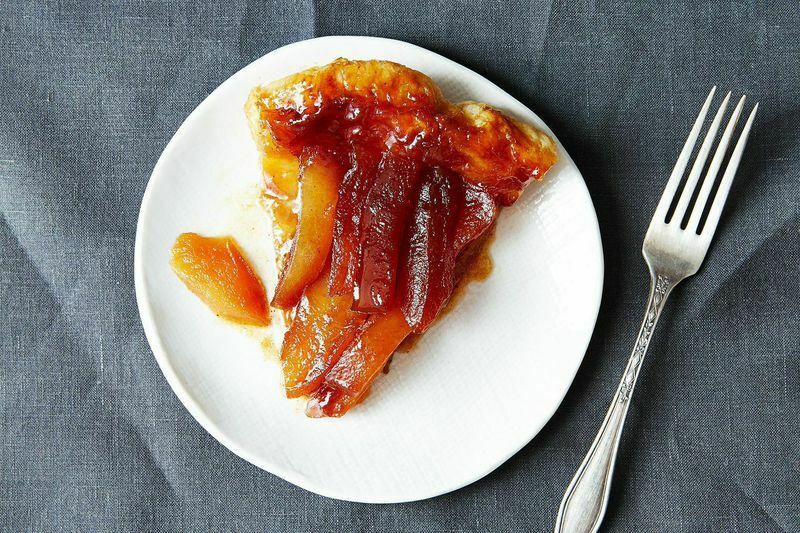 This quince tarte Tatin is flavored with honey and vanilla bean. Since I'm already messing with tradition by caramelizing maple instead of sugar, I use the less traditional but no less delicious pear in place of apples (but you can easily change out of the fruit if you prefer). Pick a firm pear like a Bosc so that it holds its shape when you invert the tart. The pears release juice as they bake, so when the whole thing comes out of the oven, you'll see that the juices and maple caramel will have combined into a bit of a sloshy mess. Put the cake pan directly on a low heat burner and bring the whole thing to a low simmer. Let the juices and maple simmer and thicken until the caramel gets thick again...and then invert. The resulting tart is golden brown, fragrant, and glorious. 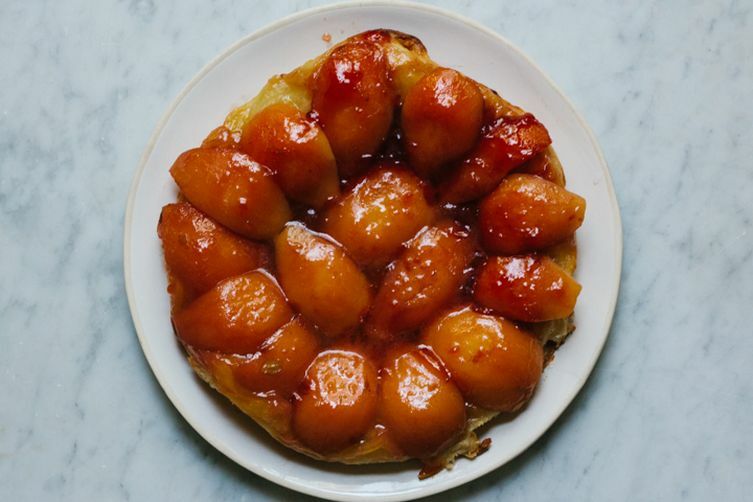 It was more of a planned experiment than an accident when I first made this version, but I felt as triumphant as the Tatin sisters must have many centuries ago when I made my maple pear Tatin and turned the classic on its head. I am a pastry chef/restaurateur in Boston passionate about all things sweet and savory. I co-own Flour Bakery+Cafe and co-own Myers+Chang, both in Boston. I love my work, I'm crazy about my husband, my staff keeps me going and is truly the most amazing group of people I've ever known, I am addicted to ice cream and fruit of all kinds. I used to run marathons but have scaled back a bit and am trying to be more well-rounded by attempting yoga. I read voraciously, I plan obsessively, I feel so very lucky to have found a life partner and a life passion both of which make me happy every day. Do you really mean 160 ounces of syrup? or 1/2 c.? please clarify.